Last night, we participated in an all night prayer meeting at our church. The Lord had impressed on our Pastor’s wife, Carla Shipp, that our church needed this time to pray. We have many members who are dealing with significant afflictions and we are desperate, as so many of you are, for God’s presence and direction. We had times of worship, times of corporate prayer and times of personal prayer. It was really a wonderful night. We stayed from 7:30 pm – 3:00 am. I was so excited to see that Clay made it that long! I would offer to take him home so he could rest, and then someone else would come pray with him and he would get encouraged to stay a while longer. That happened several times. Finally, at 3, I could tell he was getting pretty exhausted, so we came home. He has said the same thing probably 100 times since he’s been sick, but I never get tired of hearing it. As he was speaking, I looked around and people are just so focused on what he’s saying. There is something VERY powerful about listening to a man who is dying. His words are powerful. He just thanked everyone for their prayers and then he made sure they knew that he is ok. He often says, “To live is Christ, to die is gain.” He believes it. It is very real to him right now. The truths he has known all his life have moved from his head to his heart and he has learned a new reality of Christ as he faces death. I think the most convicting thing about his faith, is that he is not clinging to this world. Now, if you know Clay, you know that he LOVES some things in this world with a big love. He has always loved sports, movies, music, people, coaching baseball, friends, family, and me. He really loves me. But, as soon as he accepted that this disease could take his life, he willingly laid it down for the will of God and he never looked back. He has never said to me that he is going to miss the world. He’s not asking God if he can watch the Dodgers from heaven. He worries about me and the kids, his parents, my parents. He wants us to be taken care of and loved, but he isn’t clinging to this world. He means it when he says that he is excited to go to heaven. Don’t mistake this for giving up. He has never given up. He has done everything the doctors have suggested and he has lived life for 15 months. He is vibrant and he looks so healthy. He is not giving up…he is just content to accept whatever the will of God is. It is very inspiring and simply amazing to see. I challenge you to really ponder your own faith. Do you trust God this much? Is Jesus this real to you? If not, He can be. You can know Him in this personal way. Come visit Clay and he’ll tell you all about it! We have had some really good visits the past few days. I love to see how Clay perks up when people come see him. This is Steve and Penny Loving. We met them through Facebook and mutual friends just after Clay was diagnosed. Statistics say that only 2-3 in every 100,000 people get Glioblastoma, but it seems like it is much higher than that. We’ve met so many people who have it, or have lost loved ones to this disease. Steve was diagnosed with Glioblastoma in March of 2016, and Clay was diagnosed in May. They have shared many resources with us and Penny and I have become friends. This is Dan Dix. He was Clay’s pastor when he was in college. Clay talks so often about people in his life. God used many people to shape him and help in his relationship with the Lord. Dan was one of those people. We visited for a while and we talked about the goodness of God. I have some wonderful friends in my life. This morning, Christy (Chenevert) Mac came to see me. We grew up together, and although we don’t see each other often, she has blessed me many times during the past year. She came to share some things the Lord showed her for me. There were two specific prayers that I was praying at the prayer meeting last night. I was asking the Lord to show me what He desired in two very specific decisions I need to make. The Lord confirmed His answer to me for both questions this morning while she shared her heart with me. He hears our prayers, y’all. He is listening. And, He loves us and wants us to have his guidance in our lives. Thank you, Christy. I’ll never forget our sweet conversation. God really used you today. I love the sign in the background, and the words are so fitting. His grace abounded to me today. The Mullins’ visited today! Clay always says he had 2 sets of sisters. On his mom’s side of the family was Kellie, Emily and Amy Mullins. On his dad’s side of the family was Joanna, Jessica and Jennifer Janet. He has two brothers, so it’s kind of cool to think of how they all had each other growing up. He is so loved by his family. I love to watch them just look at him while he talks and I love to listen as they tell him how special he is. He tries to shrug off the comments, like he’s not anything special, but I think it is so evident by the outpouring of love over him while he’s been sick. He is so loved. He is a unique person. A few weeks ago, Clay and Sam found Clay’s old Atari in his mom’s attic. Caleb took it home and cleaned it and got it working. He brought it back today and we all played Space Invaders and Donkey Kong. Clay kept telling me to give Caleb $1000 because he fixed it. Um…..I didn’t do that. But, we did tell Caleb how great he is several times. Many of you have asked me how he’s doing physically. I give thanks everyday for his strength and the life that is still in him. You can see it in the smile on his face in these pictures. His biggest struggle is fatigue. He sleeps a lot and he’s tired most of the time….unless he’s visiting with people or at the all night prayer meeting! Most days, he sleeps until noon and then naps in the afternoon. He sleeps very well at night. He has occasional headaches, which seem to be coming a little more frequently lately. But, they usually only last a few minutes and they are not too painful. His short term memory is terrible. But, he knows it and he laughs about it a lot. Every now and then he’ll get a little frustrated because he can’t remember something, but most of the time we just laugh. He asks the same questions over and over again, and he gets easily confused. I find that topics that cause deep emotion are harder for him to remember. It took him over a week to remember the diagnosis from MD Anderson, and he still asks me for clarification on it sometimes. Every time I remind him, he first asks if I have told the kids. Then, if I’ve told his parents, and he wants to know how they responded. He’s always thinking about everyone else. His eyesight is still really bad. It is worst when he’s tired. He can’t read very much and he doesn’t see things at a distance very well. But, he’s been to a few baseball games and found a way to enjoy himself. He watches TV with us sometimes, but he’s never really “into it.” He just enjoys being with us. We have so much to be thankful for. He is able to do most things for himself. I have to remind him to do things, but as long as I guide him, he can do things for himself. He doesn’t have pain. He hasn’t been nauseated and sick. He doesn’t have difficulty with his speech. He hasn’t lost a bunch of weight. He can walk, and talk, and eat, and do almost everything that we do. Every time I’m tempted to be sad about his side effects, I just remember how blessed we are. It’s hard for me to type these words, but we are meeting with Hospice on Monday. It is an introductory meeting, and we know that it doesn’t necessarily mean the end is here. It really just means that we aren’t going to be receiving treatment from his doctors any longer. They will help us manage his symptoms and any pain, and they will help us prepare for what is ahead. God has comforted me greatly during these past few days. His peace has covered us and I know that He is directing our footsteps. I believe that God can heal Clay at any time. We all do. Our faith is strong. And, the Bible says that all we need is the faith of a mustard seed, if we are believing God for something He desires to do. (Christy reminded me of that this morning.) We have the faith of a mustard seed. I’m sure of it. So, we will continue to pray and believe God. He is able to do far beyond what we ask or think. God is still using Clay and working through him. He’s not finished, yet. Stay tuned because I fully believe there is much more the Lord desires to accomplish. Much love! We have known since Clay was first diagnosed that this moment would come. I wondered so many times how I would feel, and what I would think. And, now I know. It’s here. You know…that moment when they tell us that the doctors and medicine can’t help us anymore. The end of man. The end of treatment. But, not the end of hope. Our hope is in Jesus, and He never changes. He never fails. He is never surprised. He is never confused. He is never dependent on medicine. He is never dependent on man. He is never dependent on me or Clay. He is in control, and always has been. When we saw Dr. Weathers last week at MD Anderson, she told us the full truth about where we are in Clay’s treatment. Because the cancer has spread to his spinal fluid, there is no more treatment available. She recommended we call Hospice. Even though we both knew this day would come, if God did’t heal Clay, we had to catch our breath. When you receive news like this, you don’t know what to say or what to think. You run out of questions really fast. And the room gets quiet while you try to compose yourself and talk more because you really don’t want the conversation to end because that’s when you’ll have to let it sink in. We drove home dazed. Our faith was sure, but our minds were dazed. We were digesting the information just a little bit at a time. It took several days for me to process and accept it. In the meantime, Senator John McCain was diagnosed with Glioblastoma. Because of his diagnosis, this disease has been on the news, a lot. Many doctors and patients have been interviewed and new treatment options have been highlighted. This caused us to wonder if there really is something out there that can help us. One of those is CAR-T therapy being performed at City of Hope Hospital in Los Angeles. I called them. And, this is not going to be an option for Clay. Dr. Weathers mentioned that there was one chemo pill, Lomustine, we haven’t tried, yet. But she spoke with great caution, so not to give us hope. The potential for side effects is much greater with this medication. At best, it would slow the progression slightly, but not significantly. Clay’s deepest desire is to enjoy quality of life while he is still here. He has made that very clear from the beginning. This medication could cause a drop in white blood cells, which increases risk of infections and it usually causes flu-like symptoms with nausea/vomiting. But, we decided to take at least one round of it. We planned to take it this week and just see if the side effects were manageable. If not, we would stop it right away. Well, we had multiple issues getting the medication. Each time there was a problem, I felt more and more unsettled about it. I became more and more restless in my spirit about all the options. I was restless about even the idea of trying find an option. It is so difficult to know how to continue to believe God for a miracle, while accepting the truth. Am I giving up if I face reality and begin to prepare for the worst? Am I letting Clay, his parents or our kids down if I can’t find a cure? Am I making the right choices? What will people think of me if we accept the diagnosis and stop trying to find an answer? The same Psalm speaks of the protection of God from our enemies. It reminds us that He alone is our salvation. We don’t have to fear. We can remain confident and assured because our God is stronger than our enemy. He will hide us in His sanctuary when troubles come. Surely, God will not leave us now, if He has been our help and strength all along the way. Then, this. I love this verse…. God is not going to leave us. He is going to continue to direct our steps and we are going to continue to see His goodness NOW…in the land of the living…today. I was so encouraged as God gently reminded me that this uncertainty, fear and all these questions are not from Him. He is my peace. So, I gave it to Him this morning, and I set my heart and affection on Him. I inquired in His temple and purposed in my heart to continue to do so. We were scheduled to see Dr. Russell, to get his opinion. He is so gracious and we’ve always felt so comfortable with him. We told him at the beginning of the conversation that we feel unsettled. We don’t have peace about the options with which we’ve been presented. He agreed and highly recommended that we NOT take the chemo. He believes it is going to make Clay sick and that it won’t help. There are other treatments and experimental things being done for Glioblastoma, but we have now had several doctors confirm that the worst case scenario has happened. Cancer in the spinal fluid is not treatable. We are at the end of man. Dr. Russell’s team came and stood in a circle to pray for us. These people have meant so much to us during this time. I’ll never be able to express it. Clay got choked up several times today trying to tell them. When we left Dr. Russell’s office today, Dr. Gummadi (our dear friend from church who has walked with us the entire time) came to see us. He said, “This is the first time I’ve felt peace in a while.” I agreed. Clay agreed. We just know in our spirits that God has brought us here. He is continuing to direct our steps and He wants us to be in His hands. Only His hands. He is the ONLY answer, now. The answer to our need is in Him. He has used medicine and doctors to give Clay a really wonderful 14 months. Y’all, we have LIVED. Clay has enjoyed his life for 14 months. We’ve had great family time, incredible visits from friends and loved ones, great vacations, opportunities to minister and share our testimony. The list goes on. We have lived life. And Clay has been a shining example of how to live a life submitted to the will of God. He has never been afraid. He has never wavered in his faith. And God has blessed him abundantly for it. Why is God allowing this? I don’t know. And, I don’t ask. I just trust Him. He sees what we can not see. He knows what we can not know. And He loves us more than we can comprehend. So, the only logical conclusion is that He is using this trial to accomplish something that He couldn’t accomplish any other way. And, He chose a very willing, very capable servant through which to accomplish His work. I’ve been amazed to be by Clay’s side. I want to thank all of you for your prayers. Thank you for your love and support. It has been life changing for us. I truly believe we could not have remained strong without your prayer and love. Now, please press in and help us continue to pray. We are desperate. We are praying for a miracle. But, we are also praying for endurance, strength, and willing hearts that will allow God to do whatever He wants to do. We are praying that our faith will be strong to the end and that God will receive tremendous glory through our lives. We are praying for the faith of our children. God is ministering to them, but please help us pray for spiritual maturity and strength. Our church is holding an all night prayer meeting tomorrow night. The timing was ideal, so I know it is God. We will be calling out to Him. And, His Word promises that He will hear our cry and draw near. Thank you, Jesus! This past Sunday, we had a semi-surprise visit from 23 precious people from Victory Academy. The Lord just put in on their hearts to come and pray for us at our home. It was such a sweet time. Clay spoke from his heart and really encouraged the young people that they are not too young to know the Lord. He begged them to give their lives to Him and LIVE for Him. Everyone prayed over him and prayed for our family. It was a really special time. We love you, Victory Families. We had several visitors last week, when we got home from MD Anderson. Every time someone would knock on the door, he would perk up. The visits are so good for him. We spent Friday evening with my family at Amy and Jason’s house for Janet’s birthday party. It has meant a lot to me to see how much my family loves him. We have had some incredible times of prayer with our church. Our church has prayed so hard for us, and others who are suffering right now. The body of Christ has been so important to us during this time. I know the one very difficult question on many of your minds is, “How long does he have?” That question is on our mind, too. But, I have truly learned that only God knows the answer. Our doctors don’t know. Every case is different. Statistics say that we have between 1 and 6 months. But, we believe that God only knows. And, in His mercy, we believe He will prepare us and help us. I will continue to write and keep you all updated. We love you! I took this picture this Sunday at the end of our service. The altar had been filled with people praying and worshipping the Lord, and several had come to pray for him. But as others started to leave, Clay just sat there while Anna played. I think she was singing “‘Tis So Sweet To Trust In Jesus.” That is an anthem for him right now. Since his diagnosis, a little over 14 months ago, this is where he has been. In an altar before the Lord. Constantly laying down his will for whatever the Lord wants to do. Not begging and pleading for his life, but patiently telling the Lord how much he loves Him and how much he trusts Him. Just waiting on God to accomplish His will….not Clay’s will. God’s will. As many of you know, we spent the day at MDA. We received very difficult news. The tumor is growing, but rather than growing as a mass, it is in the spinal fluid. This means surgery will not be an option. It is no longer responding to the meds and it will become very aggressive now that it has learned how to grow again. It will spread quickly because it is in the fluid. I haven’t written in a long time, so some of you may not know, but he has had an increase in side effects over the past two months. 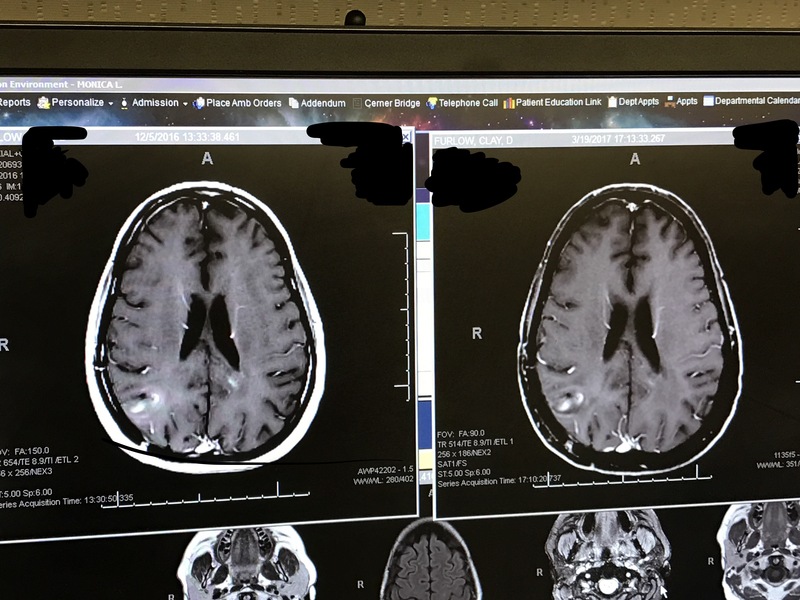 His onset of symptoms have been consistent with tumor progression but the MRI had no reflected it….until today. The doctor warned us 8 weeks ago that MRI is not a perfect science. So, we knew it was possible that the tumor was growing. But, we thought another surgery would be possible. There is one more drug we can try but she said it would have strong side effects and add only a small amount of time. We took the information and will begin praying about taking it. Clay is very concerned about quality of life, so that will play a major role in our decision. We’ve always known this day would come, if God didn’t do a miracle by now, but I’ve learned you can never be prepared to hear this. We are trembling a little but God is faithful. We are in the car now, driving back to Baton Rouge. When we got in earlier, I turned on Pandora radio just to have some soft worship music playing. The first song that played was “Holy Spirit” by Kari Jobe. I love that song and it has ministered to me so many times. I thought to myself how sweet the Lord is to send me little reminders that He is with us. Then, it played again. That never happens! I know it was the Lord letting me know that He did that on purpose. That’s what we need. He is our living hope. We just need the Holy Spirit to come and He has. Clay is as solid as a rock. He never wavers. It is such a miracle to watch. I love him. What a blessing to go through this with a man of such faith. We still have a peace that passes understanding. The devil can’t take that. Please pray. Pray for wisdom for our next steps. Pray for our children. Pray for God to receive great glory. Pray for many more miracles to come. We love you. I will begin writing more often. (Many of you have asked me.) God had already been stirring me to do it and, now, I trust He will have a lot to say. Thank you so much for reading, for praying, for encouraging and serving us. Your love has meant so much to our entire family. Prayers and Birdies for Clay! March 31 was one of my favorite days since May 2, 2016. 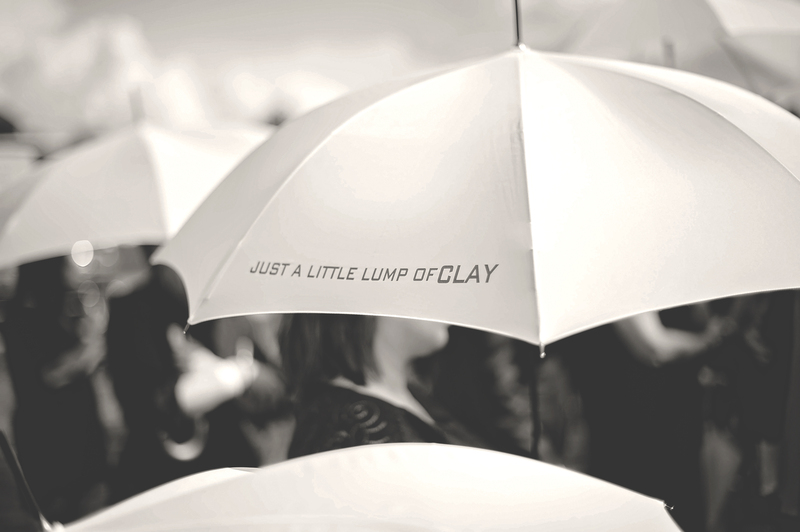 Everyone met at The Bluff’s in St. Francisville, and the day was a true celebration of Clay. He was surrounded by old friends, new friends, family, and strangers, who all came to support our family and support Clay in his fight with cancer. When Clay’s brother, Ron, thought of the idea and started telling us what he wanted to do, I have to admit that I didn’t expect anything huge. I was thankful that he wanted to do it, and I knew Clay would have fun, but I underestimated how great it would be. So, I spent the entire day overwhelmed with emotion because of the outpouring of love. It was a HUGE success! Ron did a wonderful job planning and preparing everything, and 18 teams of golfers showed up! Several of us met there Thursday night and stayed in the Inn on the property. We had dinner on the patio at The Francis, which was delicious. The weather was perfect! The company was superb. The sunrise was beautiful, especially over the golf course. The Bluff’s is an amazing place. It’s out in the country, so the surroundings are peaceful and quiet. Golfers arrived early for an 8 am shotgun start. Ron led everyone in a prayer and the carts sped away to their starting holes. Clay could have played. He was actually feeling pretty good that day, but he knew that he would rather have time to visit with everyone. Because we were the only people using the golf course, those of us not playing had a great time riding around on the golf carts and visiting all the teams. Look at our little train we had going! It was so much fun! We stopped at every hole so I could take a pic of Clay with every team and so he could thank them for being there. It was so cool to see how many people really love him. Here are some fun shots from our train ride around the course. It’s a good thing there was no Marshall riding around. We broke a few rules! Clay was fussing at us the entire time and reminding everyone to be quiet when players were lining up to swing. We tried. These are some of my favorite pictures of Clay visiting with the players. Several of my friends and wives of the players came to help in the clubhouse. We had a great time setting up the room and visiting with each other. Our dear friends at Montalbano’s Seafood donated jambalaya, so when the players began arriving back at the clubhouse, the food was served. There were raffle items, a silent auction, food and drinks for everyone to enjoy. Many of Clay’s family members came to support him. Once all the teams arrived, it was time to announce the winners. With a score of 57, Bo Capdeau, Rex Cochran, Todd Browning, and Wes Jacobs took home the winners trophies! 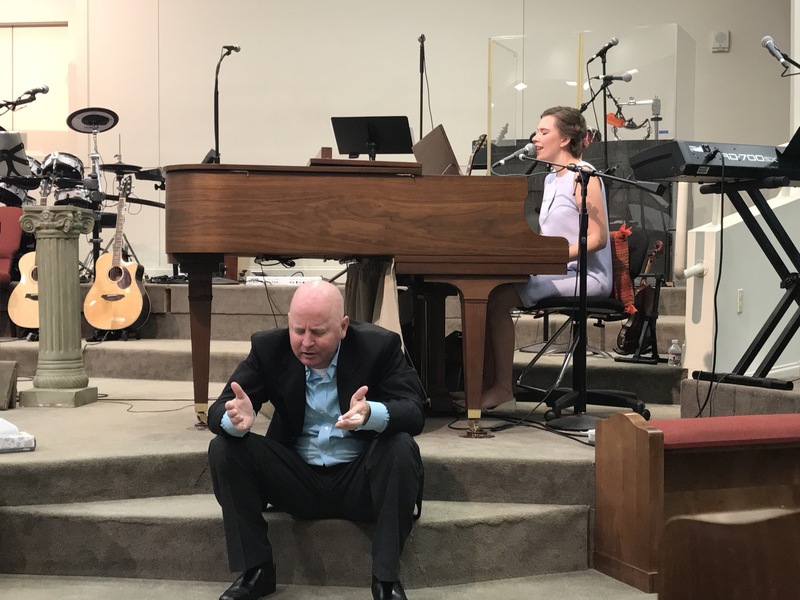 A really special moment happened when Clay’s cousins, Jennifer and Jessica, performed a song that Jennifer wrote for him. Growing up, Clay was really close to Jennifer, Jessica and Joanna. He calls them his sisters and they refer to him as their brother. They are all 3 talented musicians and singers. Jennifer tells the story in the video below, but on May 13, when Clay was in surgery, she wrote a song. The song is really just a praise song to the Lord, but she wrote it in Clay’s honor. She and Jessica performed it live and everyone ended up signing along. Listen. It’s really, really good. She published the song on iTunes, and donated all proceeds from the sale of the song to Clay. So sweet. You can find it in iTunes – Jennifer Janet, Joy A Song for Clay. You may want to skip to :37 where they start introducing the song. Then at 2:03 they start singing. Whatever you do, please listen at 5:53. Clay shares some thoughts with everyone there after the girls sing. You need to hear what he says. Since Clay’s diagnosis, and I mean since the very minute that he was told about his condition, he has taken every opportunity to tell anyone who will listen that God is His Savior and he is not afraid. He always told me that he wasn’t an evangelist, but he has become one. I live with him, y’all. And, I’ve spent just about every waking minute with him since that day, and he has never wavered. Even in his sad times, even in his difficult times, even in his frustrated times. He has never wavered in his faith. He has never asked “WHY?” I’ve never heard him say, “Why me?” I’ve never heard him express anger toward God. I’ve never heard him express self pity. He has known from the beginning that God is in control. If he does not survive this brain tumor, it is only because God is ready to bring him home. You wonder why he’s never been afraid? Because peace that passes understanding is real. Because eternal life is real. And, we can have a confident assurance of the hope of eternal life while we live here on earth. We can KNOW that we are going to heaven. You can know. All you have to do is surrender your life to Jesus. Just give your life to him. Admit that you are a sinner, that He is your Savior, and tell Him you want to live for Him. Then, you can have the same peace…the same assurance…the same comfort….the same calm….the same love for God that you see in Clay. Even in the face of death, you can have peace. Now, that is truth. That is a testimony. People can say they love God, but when a man is walking through the valley of the shadow of death, and he can still proclaim the goodness of God – you know it is real! Clay is doing that. And it is so amazing to watch. I believe the Lord orchestrated this day so that Clay would have an opportunity to share these words. It was very moving and powerful. But, the icing on the cake was the money that was raised. I wish I could make you guess before you get to see the answer. Your guess wouldn’t even be close. I was completely amazed when I saw the total. The efforts of so many people, and the generous giving of many who came, resulted in a little over $9,000 of support for our medical bills!!!!!! We are still waiting on some pending charges, but I think this is going to cover what we will owe for 2017 expenses, so far. The Lord miraculously provided every dollar we had to pay out in 2016, and now He has provided for 2017. One of the greatest lessons I’ve learned this year has been regarding the value of friendship. God has used the people in our lives to bless us beyond measure. He has provided for our every need through the people we love. He has met every need through the people He placed in our lives over the years. We love you and thank you for being obedient to God. He will bless you beyond measure. I want to thank a few people specifically. ITI Technical College – Joe Martin has been a friend to Clay and me for the past few years. He owns and operates ITI Technical College on Airline Highway in Baton Rouge. It is a beautiful campus and a great school. Thank you, Joe. We love you and appreciate your support. Senator Bodi White – our sweet friend, Angel Rayborn, who was Ben’s 5th Grade teacher, helped raise funds and items for the silent auction. She had a connection to Senator White and he was generous to our cause. We have never met him, but truly appreciate his giving and support for our family. Thank you, Angel! Montalbano’s Seafood & Catering – We have been lifelong friends with the Montalbano’s. They employ two of our kids, and we eat there on a regular basis. The seafood is delicious, and the atmosphere is friendly. They cater for large parties, small gatherings, or you can enjoy the food in their restaurant on Florida Boulevard. Thank you, Randy, Darlene, Randy, Jr., and Emily. We love you so much! And, not just because you make great boudin balls…..
ProMax Marketing – Jimmy Cook is our brother-in-law. He owns ProMax Marketing here in Baton Rouge. Jimmy created the logo for the shirts. If you look closely, you will notice that the golfer in the logo is Clay! I just think this is so cool. It is an older pic of him – a pre steroids pic! Look at that form! Thank you, Jimmy. You’ve been a huge support to us and your talent really came through in this logo. Crown Trophies – Jay Thompson grew up with Clay and Ron. He married a friend of mine from middle school, Michelle Morris, whose dad, Jeff Morris, has been very close to us during this time. Jay donated the winners trophies, plus a beautiful trophy for Clay to keep. Thank you, Jay. We wish you could have been with us, but your FIL did a great job representing you! The trophies were so nice! There was a 7th Corporate Sponsor who donated the remaining food items and drinks. He wished to be unnamed, but I hope he reads this and understands just how much his donation meant to our family. Thank you so much for your generosity! I also want to thank and acknowledge Tom Agazzi for his hard work. He is the Pro at The Bluff’s, and his effort made this event so nice. He was calm and in charge. He knew just what to do and how to get everyone where they needed to be. I can’t imagine a nicer place to have spent this day. Thank you, Tom! Tom’s wife, Mandi, worked for me for several years at Capital One. I love her! She came and we got to spend a little time together. Thank you, Mandi. I miss you and love you dearly. It would be difficult to thank everyone who was involved with planning and serving at the tournament. If you came, donated, bought a raffle ticket, bought a silent auction item, helped prepare food, helped set up the room, or anything else…..THANK YOU! The day was very special to our family, and it could not have been possible without you. I need to specifically thank Caryn Daigle who helped in so many ways. She assisted Steve and Ron in the planning, preparation of food, and so much more. Thank you, Caryn. You really made a difference! Clay’s brother Steve Furlow was with Ron every step of the way. He kept everyone on task and did a wonderful job of making sure everything got done. We love you, Steve! This entire event would never have happened if it wasn’t for Ron Furlow. Ron is Clay’s oldest brother (by 6 years) but everyone thinks they are twins. He had some past experience with golf tournaments, but it has been a long time since he had participated in something this big. You never would have known it. He pulled it off flawlessly. Ron, I have thanked the Lord so many times for you. It gives me tremendous peace of mind to know that our needs are met for this year, and that is mostly due to you. It was your vision, it was your hard work, and it was your heart that made this happen. Thank you is not nearly enough. We love you! I’m sorry it took me so long to write this post and share it with you. Many of you have asked about the event. Thank you so much for your love and participation. I’ll end with this great pic of Clay with his mom and dad. They feel so loved by all of you, too.